We’d love your help. Let us know what’s wrong with this preview of The Bone Sparrow by Zana Fraillon. Carrying a notebook that she's unable to read and wearing a sparrow made out of bone around her neck - both ta Born in a refugee camp, all Subhi knows of the world is that he's at least 19 fence diamonds high, the nice Jackets never stay long, and at night he dreams that the sea finds its way to his tent, bringing with it unusual treasures. And one day it brings him Jimmie. To ask other readers questions about The Bone Sparrow, please sign up. What genre is this book coming from? would this be suitable for a 10 year old girl with competent reading skills? THE BONE SPARROW so needed to be written. And I’m ashamed of that. I’m ashamed of our species; that we can show such cruelty toward refugees and asylum seekers. For once, I wish I could have said that there are million books like this one, and we’re so aware of the way refugees and asylum seekers are treated that we put a stop to such dark detention centers years ago. But that is not the case. So thank you Miss Fraillon for taking the time to write this revelatory, touching and lyrical novel. This THE BONE SPARROW so needed to be written. This story follows refugee Subhi, who was born at the detention center, his reckless best friend Eli and Jimmie who needs Subhi as much as he needs her. The symbolism is extremely powerful. I especially liked the duck, to whom Subhi talks and who talks back. It says everything Subhi wished he would, but doesn’t have the courage to. We all think things we wish we could say but can’t. Be warned that it’s a slow-paced story. There also isn’t a plot per se, which can sometimes be positive because it opens the door to many surprises (though not always welcomed ones). Again, thank you Miss Fraillon for this unforgettable book. May it reach the hands of dozens of thousands of readers. "Coming here is a bit like waking up from a nightmare and then finding out that you aren't awake at all." 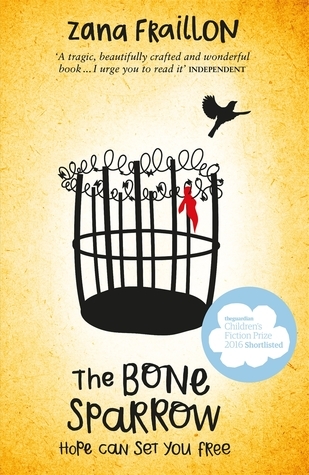 The Bone Sparrow is a middle grade story about a young boy named Subhi who was born and lives in an immigration detention centre somewhere in Australia. Although fictional, details about the daily life and treatment of the immigrants are based on reality. Because of all of this I wanted to read this and really wanted to like it too. But I couldn't find myself getting invested in the writing. For me, I needed much more depth of character and story detail. There was great potential to especially explore the background of Subhi's friend Eli who was a sort of protector towards Subhi. And I also would have loved to have read more about his sister Queeny and what made her truly tick as she was such a feisty character. The girl from outside the fence, Jimmie, was very sweet but again I felt her background story was lacking. However, I am aware that this is a middle grade book and I am well beyond the target age range of the story and will therefore award it an extra star as middle grade books tend to skirt around the type of character detail and background stories that I am looking for. Had I read this at 11 or 12 years old I am very sure that I would have enjoyed it and that it would have been a huge eye opener to me about the harsh realities of life as an immigrant. STOP WHAT YOU’RE DOING AND GO READ THIS BOOK RIGHT NOW. I just finished it about half an hour ago and I’m reeling. Beautiful, poignant, enlightening, heartbreaking, and hopeful - this, THIS is why middle grade books should absolutely not be overlooked as worthy literature. This should sit right alongside other books shedding light on the plight of refugees and asylum seekers. This is the kind of book that helps all our hearts grow bigger - big enough to make sure that no one in this scary world STOP WHAT YOU’RE DOING AND GO READ THIS BOOK RIGHT NOW. I just finished it about half an hour ago and I’m reeling. Beautiful, poignant, enlightening, heartbreaking, and hopeful - this, THIS is why middle grade books should absolutely not be overlooked as worthy literature. This should sit right alongside other books shedding light on the plight of refugees and asylum seekers. This is the kind of book that helps all our hearts grow bigger - big enough to make sure that no one in this scary world is forgotten. Read it. This book is horrifying disturbing and alarming. Yet it is also a story of hope and love. I really liked that both Jimmie and Subhi are trying to find out who they are by remembering people and stories from their families and the past. I could not put tbis down... and read it whenever I had the chance. As an adult reading this, I think there is a responsibility we have to ensure that all people are treated in an humane and compassionate way, no matter how they come to our country... and no matte This book is horrifying disturbing and alarming. Yet it is also a story of hope and love. I could not put tbis down... and read it whenever I had the chance. As an adult reading this, I think there is a responsibility we have to ensure that all people are treated in an humane and compassionate way, no matter how they come to our country... and no matter what their circumstances. Also that we SHOULD question why asylum seekers are treated as criminals. Zana Fraillon, an Australian author, has penned a heart breaking and thoroughly compelling tale about refugees in her latest book, The Bone Sparrow that is centered around a young refugee boy living his days with his mother and his elder sister in an Australian detention camp where he spends his days helping his orphan friend to smuggle and with an outsider to help her read the stories about her family history, all the while longing to meet his father across the ocean and to save his soul from such a wretched place. Subhi is a refugee. Born in an Australian permanent detention center after his mother and sister fled the violence of a distant homeland, Subhi has only ever known life behind the fences. But his world is far bigger than that—every night, the magical Night Sea from his mother's stories brings him gifts, the faraway whales sing to him, and the birds tell their stories. And as he grows, his imagination threatens to burst beyond the limits of his containment. The most vivid story of all, however, is the one that arrives one night in the form of Jimmie—a scruffy, impatient girl who appears on the other side of the wire fence and brings with her a notebook written by the mother she lost. Unable to read it herself, she relies on Subhi to unravel her family's love songs and tragedies. Subhi is a 10 year old Rohingya refugee from Myanmar living in an Australian detention camp along with his mother and elder sister, where the living conditions are extremely poor, not to mention the worm-filled food that they are fed in a handful amount once a day. But Subhi is content with his life as well as with his unhinged dreams about the Night Sea bringing him gifts from across the ocean, in that detention camp where he along with his best friend, Eli, played all day or sometimes Subhi helped his friend to smuggle things around the camp. But once Eli is sent away to live with older single men in a different part of the camp, Subhi found yet another friend in his rubber duck that one of the guards brought for him and surprisingly he shared about his day with the duck and that duck advised right back him. And when Jimmie, a 10 year old girl manages to enter the camp from the outside, Subhi finds the world even more enthralling and mysterious beyond his imagination, although there are lots of mature decisions that Subhi needs to take before he loses his friends as well as his family in that wretched life forever. The lives of refugees are hard, that we know, but how painful that are and how unfortunate that are, we rarely get to know that. As least from the inside. And that's what this talented writer has succeeded by penning a strikingly heart breaking story of a little refugee boy born in a detention camp, where the living conditions are so poor that a normal human being cannot imagine to live there even for a day. Through this 10 year old child's voice, the readers will get a thorough insight into the raw and honest world of refugees in detention camps, a human being, with no passport to go back home and at the same time, no permission to settle in a foreign country, its more liking living on the edge of a country, ill-treated daily to remind them that they are outsiders and that they must be grateful towards the country who are allowing them to live and eat for free. The author's writing style is coherent and extremely brilliant, laced beautifully with deep, heart felt emotions that will make the readers fall for the story. The narration is thoroughly evocative and innocent as the author gracefully captures the voice of a 10 year old boy through whose eyes the readers can easily comprehend the world without flaws. The dialogues are so compelling that it will beg the readers to keep a firm grip on the story till the very last page. The story is unraveled without much layers yet it aspires for a slow pace, so impatient readers must look away, whereas this turns out to be a perfect read for all those who love to enjoy a novel gradually through its folds and progression. The characters are well developed, complete with realism to make them look believable in the eyes of the readers. The protagonist, Subhi is an innocent little child with a smart mind and knows how to survive mutely in harsh conditions, and his sense of responsibility towards his family is really beyond any words. He reflects impeccable maturity despite of his tender age when it is necessary but his story will keep the readers rooted till the very end. The supporting characters are equally well etched out, especially the characters of Subhi's bossy elder sister, the sweet and loving Jimmie with a plan, the clever rubber duck with a sharp mouth and a strong yet sad young orphan boy, Eli. Each and every characters from this book are bound to leave an impression on the minds of the readers long after the end of this story. In a nutshell, this heart wrenching story will make the readers shed a tear or two for the characters' plight in a sad, sad dump that they call it home. Verdict: This poignant yet enlightening journey of a 10 year old refugee boy is a must read. This book was devastating and enlightening and delightful all at once. The story follows two very different young children, as they discover more of the world through their friendship with each other. From the moment I met Subhi, a young refugee born in an Australian detention centre, I knew that his story would be heartbreaking. And it definitely was. If you want to learn more about the refugee situation and how asylum seek "WE ARE INNOCENT. If you want to learn more about the refugee situation and how asylum seekers are being treated in Australian Detention Centres, then this is a very informative book. It outlines the disgusting and abhorrent conditions that these people suffer through every day. At the same time though, through Jimmie, a young girl living in a town near the detention centre, Zana shows the potential of all Australian's to accept and welcome refugees into our society. I think that it's extremely important that we all become aware of what Australia is NOT doing in regards to the refugee problem, and the ways that we can try and change refugee treatment. Overall rating; 4.5/5 stars. This really was an excellent book. Subhi, the main character, is a child born inside an Australian detention camp to a Burmese refugee. The way the story progresses is a work of art, with the reader taking the journey with Subhi as he grows to realize the only world he has ever known is not at all normal or fair. It’s a painful path to take with him. There are occasional chapters written in third person about the life of Jimmie, a girl fr There are not enough stars to give “The Bone Sparrow.” Even a thousand would be insufficient. Trigger warnings: this book follows the story of refugees in a detention centre, so...PTSD, mistreatment by guards, murder, hunger strikes, self harm, and a multitude of other things. This book was veeeeeeeeeeery slow to start for me. The first...50-75 pages was a serious struggle and it reminded me a lot of The Boy in the Striped Pyjamas, seeing as it was narrated from the perspective of a ten year old who had very little understanding of the broader situation going on around him. But then, wit Trigger warnings: this book follows the story of refugees in a detention centre, so...PTSD, mistreatment by guards, murder, hunger strikes, self harm, and a multitude of other things. But then, without even realising it had happened, I was COMPLETELY HOOKED and I sped through the rest of the book. This is so beautifully told while also being absolutely horrifying to read. Fraillon doesn't pull any punches about the way refugees are treated in Australian detention centres. I loved the friendship that develops between Subhi and Jimmie. I loved the storytelling elements. I loved Subhi's friendship with Eli and the complexities of his relationship with Harvey. And I love that by making Subhi and his family Rohingya, Fraillon has made the story incredibly timely. I was pleasantly surprised by this - I really really enjoyed it! This received four stars out of five from me and I thought it was an absolutely brilliant read. It's set in an Australian refugee camp; it follows a boy named Subhi who lives there with his sister Queeny and his mother and all we know about their past so far is that Subhi has been born there so he's lived in the camp all his life and the two girls fled from their homeland far away. It focuses on imagination; it focuses on refugee li I was pleasantly surprised by this - I really really enjoyed it! This received four stars out of five from me and I thought it was an absolutely brilliant read. It's set in an Australian refugee camp; it follows a boy named Subhi who lives there with his sister Queeny and his mother and all we know about their past so far is that Subhi has been born there so he's lived in the camp all his life and the two girls fled from their homeland far away. It focuses on imagination; it focuses on refugee life; it focuses on how a story can help you escape. It's mainly about the relationship between Subhi and Jimmie who is a very impatient, chatty girl who does not live in the camp but visits through a hole in the fence. We learn that Jimmie does not have an alive mother and her mother has left her this book containing a story that her mother told to her but Jimmie cannot read so she relies on Subhi to allow her to escape into this poignant story and cling to her mother's existence. As the book goes on, it focuses more and more on letting go of the past and moving on along the path set for you and it also focuses on finding luck by actively searching for it and making it rather than just metaphorically sitting and waiting for it. There is a really obvious, stereotypical book-to-book comparison that I could make with The Bone Sparrow and that is The Boy in the Striped Pyjamas because they both focus on children within closed-off camps being invisible to the rest of the world and how conversing with someone from the outside can give you more of an identity and the consequences that can arise from it. If you liked the themes in TBITSP, which I did when I read it, then you will enjoy this book too. Another book-to-book comparison that DOESN'T offer itself to you on a plate is The Pearl by John Steinbeck. The reason for this is: I thought that what music was to Kino in The Pearl is what stories are to Subhi in The Bone Sparrow. If you haven't read The Pearl, very simply, it follows a family of three who live in a brush hut and the father, Kino, is a pearl-diver (that's really simplifying the synopsis!). There is a lot of focus in The Pearl on music and how the music playing within Kino's head adjusts to the atmosphere and how Kino just loses himself in the music to escape from what is going on but really we can see, as readers, that the music links to what his happening within the plot. That music theme in the Steinbeck book is what Subhi's stories felt like. The prime theme to do with the story-telling in The Bone Sparrow is that Subhi uses it as a way to escape from the camp and absorb himself within the characters and plot but links are made to what is happening within his life too. This is something I can really connect to because the reason I read so much is because the ultimately best thing about reading a book is the immersion and the way that you can just completely lose yourself within the book for however long you like. Now, without any details, I was bullied quite a lot between the late stages of primary school and also in the early parts of Year 7 and Year 8 so for such a long time, books were my easy way out and, especially if it was a book I really loved, I could go about my daily life with these characters alongside me and just have them in my head as a comfort. Therefore, to see Subhi and Jimmie in this novel do the same thing, I was with them the WHOLE time, I could completely connect to what was happening and I just went on this journey with them and absorbed every story within this novel. And two, did I reread sections? Yes I did! I did reread sections because I was just astounded with what Zana Fraillon could do with a sentence. "Jimmie, she stays there, holding the book in one hand and the wire in the other. She keeps that wire up, letting the wind feel its way over my face, letting me taste the air on the other side. I don't know how long we stay like that. It feels like a long time. Like when I put my head under the water. Except this time I don't need to hold my breath. This time I can enjoy the breathing. Enjoy pulling that air deep inside of me. This time the birds don't need to worry." "But when I see that girl, my brain jumps to thinking about our guardian angel, and for a moment, a long moment, I get to thinking that maybe that girl is our guardian angel. Even though it seems kind of strange that a guardian angel would wear trousers with more holes all over than mine, even, and a shirt that is way too big, but maybe that's to hide the wings, which are a definite must for any guardian angel worth their salt. Then that girl hocks up the biggest ball of snot I've ever seen - and I've seen some pretty big balls of snot being hocked around here - and she spits that snot right on to the ground. That's when I know. Guardian angels don't hock up snot." So funny! :D The only negative thing that I will say about the writing is that sometimes it is SO metaphorical that you actually lose yourself in it too much and I had to reread quite a few sections in this novel just to catch up on what was going on after zoning out. The last thing I want to say before wrapping it up is that the relationship between Jimmie and Subhi is really developed slowly and bit-by-bit which was incredibly powerful. As I've said, this is set in Australia and on the 2017 Carnegie shortlist, there is another book set in Australia: Alice and Manny, from The Stars at Oktober Bend, live in Australia and they also have a gradual friendship with a similar style of development. I really didn't like The Stars at Oktober Bend and I felt like that the friendship between Jimmie and Subhi was what The Stars at Oktober Bend was trying to achieve. It's dealing with different things but it is focused on Australia and on friendships between children. I just thought that the elements of friendship in The Bone Sparrow, which were fairly similar, were SO much more powerful! I don't want to seem unfair by comparing the two books but it is difficult not to when they are both on a shortlist for the same prize. YOU KNOW YOU'RE READING A BRILLIANTLY HEARTBREAKING BOOK WHEN YOU'RE SOBBING IN THE MIDDLE OF THE NIGHT. This is such a powerful book that needs to be read by EVERYONE for awareness of what's going on in refugee camps. Wow! That was a difficult read. But I'm so glad I pushed through. The Bone Sparrow is amazing -- tragic, heart-breaking, tear-jerking... yet hopeful, showing the power of friendship, family, love, story-telling, and remembering. I definitely needed some time to process this book. The Bone Sparrow is an amazing story -- I just couldn't take too much at once. I am definitely the target audience here. I know little about Burma or its ethnic groups, but I care deeply about the plight of refugees worl Wow! That was a difficult read. But I'm so glad I pushed through. The Bone Sparrow is an amazing story -- I just couldn't take too much at once. I am definitely the target audience here. I know little about Burma or its ethnic groups, but I care deeply about the plight of refugees worldwide (especially children) and desire (need) to know more. Everyone (13 and older) should read this book. We need to know what is going on and we need to do something about it. Refugees are not criminals and should never be treated as such or even temporarily locked up. The world may have forgotten about these refugees, but it is time to remember and set them free. I wanted to like this book more than I did. Yes, I now have a much more vivid image of how wrong conditions in refugee camps can be (this one in Australia) and an awareness of more of the ethnic Burmese minorities. The last couple chapters were a dramatic ending that were exciting, sad and I didn't fully see coming. But overall the pacing was slow and I mostly didn't connect with the characters (I did like Eli). Full disclosure -- I typically am turned off by characters who talk to an inanimate o I wanted to like this book more than I did. Yes, I now have a much more vivid image of how wrong conditions in refugee camps can be (this one in Australia) and an awareness of more of the ethnic Burmese minorities. The last couple chapters were a dramatic ending that were exciting, sad and I didn't fully see coming. The Book Return BlogI received this book for free from Publisher (via Netgalley) in exchange for an honest review. This does not affect my opinion of the book or the content of my review.Subhi is born in a refugee in an interment camp. He has never seen the outside world. He has no books, no school, and not enough food, water, or clothes. Every once in a while I stumble on a book that totally takes me by surprise. One that I haven't heard anything about. A b Read this review and more on my blog. Every once in a while I stumble on a book that totally takes me by surprise. One that I haven't heard anything about. A book that you had no idea would be so meaningful, impactful, wonderful, and life changing. One that rips out your heart, and in the process makes you a totally different person. 'The Bone Sparrow' is definitely one of those books. I had absolutely no idea what 'The Bone Sparrow' was about going in to it. Right before I started reading it, I read over the synopsis, so I had a vague idea that it was about a refuge. I was not at all prepared for the punch that 'The Bone Sparrow' gave me. First thing is that Subhi is only ten years old. Honestly, the story did seem as if it is being told by a ten-year old. As the mother of three kids around this age, I am stunned at what Sushi had to endure. Lack of enough food, clothes, water, places to bath, a school, or even a home (they live in tents) is all part of Sushi's life. It was all so absolutely heartbreaking. This is especially true when you find out that Subhi was born in the camp ten years ago and has never left. Despite his family being in the camp for ten years, the Australian government has no plans on what to do with them. Sushi's story leads you to think, 'how can this have ever happened'. Then you realize, omg, this isn't the distant past, this is present day Australia. The fact that Subhi doesn't know any better and just loves the life he leads, is just gut wrenching. Subhi makes up for many of the things he is missing in his life (like toys and books) by using his imagination. Every night he imagines a night sea lapping up against the tent flaps. The sea brings creatures and treasures with it. The way that Fraillon describes the Night Sea is so vivid and detailed, that you can actually feel the sea breeze and hear the tide. Subhi as a character is dead-on with a child his age. He is full of wonder and love and imagination. The character of Subhi's mother is not always endearing but holds true to what an adult would be going through in her situation. I did also love Sushi's sister, as she is mean to him at times but truly loves him. I also appreciate that one of the jackets (guards) as Subhi called them, was kind to him. This demonstrates that the guards in the camp are not all stereotypically bad people. Subhi's relationship with the girl he meets, Jimmie, serves to give Subhi hope and a glance at the outside world. Jimmie has suffered her own tragedy and together her and Subhi form a bond. Each child helps the other move on with their lives. In many ways, 'The Bone Sparrow' reminds me of one of my favorite books of all time, 'The Storyteller', by Jodi Picoult. Both books entwine a present day story with an original fairytale. The fairytale captures part of the ordeal that the character in the main story is going through. Although the ending of, 'The Bone Sparrow' did not wrap up as I would have liked, it did give the message that hope can be the greatest gift of all. The theme of 'The Bone Sparrow', is a timely topic. It definitely made me rethink how I view refugees. It is a multilayered, timely, and soul-searching read. It is one of the most under hyped books I've ever read. Everyone, absolutely everyone, needs to read this book now. Whoa, talk about giving someone a massive dose of perspective. This book ladles out that and then some. Imagine being born in a refugee camp . . . and then living there for the entire 12 years of your existence. You never know anything outside of the chainlink fences, you never know anything of nature and vitality, and as the Subhi laments, the only means through which you can create your own memories of something else is by listening to the stories of others. Such a sad, sad existence and one t Whoa, talk about giving someone a massive dose of perspective. This book ladles out that and then some. Imagine being born in a refugee camp . . . and then living there for the entire 12 years of your existence. You never know anything outside of the chainlink fences, you never know anything of nature and vitality, and as the Subhi laments, the only means through which you can create your own memories of something else is by listening to the stories of others. Such a sad, sad existence and one that is the reality for so many people in our world. یک کتاب ِ خوب برای این که یادمون بمونه دنیا رو به چه گندی کشیدیم! راوی داستان پسر کوچولوییه که توی اردوگاه پناهندگان روهینگیایی به دنیا اومده و از دنیای بیرون چیزی نمی دونه. . . و این منطقیه، چون دنیای بیرون هم از حضور اون چیزی نمی دونه! I'm glad this book has been selling so well, because it's an important story, but I felt it was poorly executed. Readers in the audience demographic may be more forgiving than me. Subhi is geboren in het vluchtelingenkamp en kent geen andere wereld dan de wereld binnen de hekken. Op een avond ontmoet hij Jimmie, die aan de andere kant van het hek woont. Samen ervaren ze een vorm van vrijheid door de verhalen in het dagboek van Jimmies overleden moeder. Binnen het kamp is Subhi bevriend met Eli, in mijn ogen voelde hij als zijn grote broer die hem beschermde en met wie hij lol had. Wanneer hij Jimmie ontmoet zegt hij: ‘Ik bedenk hoe anders ik me voel als Jimmie er is. Also Subhi is geboren in het vluchtelingenkamp en kent geen andere wereld dan de wereld binnen de hekken. Op een avond ontmoet hij Jimmie, die aan de andere kant van het hek woont. Samen ervaren ze een vorm van vrijheid door de verhalen in het dagboek van Jimmies overleden moeder. Het verhaal wordt verteld door de ogen van Subhi, met zijn kinderlijke gedachten, zijn fantasie en zijn woorden. Hij denkt veel na over zijn moeder die alleen maar op bed ligt, over zijn vader die hij hoopt terug te zien, maar ook over gebeurtenissen en de sfeer in het kamp. Wanneer andere mensen in het kamp besluiten in hongerstaking te gaan denkt Subhi: ‘De hele wereld is gek geworden en alles staat op instorten.’ Hij voelt dat er steeds meer spanning in de lucht hangt en dat er wat te wachten staat. Op dat moment neemt hij een beslissing die hij eerder niet had durven maken. Het is mooi dat verschillende elementen terugkomen in het verhaal en niet zomaar geschreven zijn, maar met een achterliggende gedachte. In het boek wordt ook gesproken over Binnen en Buiten en deze binnen en buiten worden niet bedoeld zoals wij deze kennen. Binnen is niet binnen in hun tent, maar binnen de hekken. Buiten is niet buiten hun tent, maar Buiten de hekken. Ze leven om Ooit naar Buiten te kunnen, als volwaardig mens. Wat een goed geschreven verhaal! Van tevoren wist ik dat het zich afspeelde in een vluchtelingenkamp, maar niet dat het zo goed geschreven was. Dit boek verdient meer aandacht, want helaas is dit wel de harde werkelijkheid in sommige kampen. Zo gaan wij toch niet om met mensen? Eight year old Subhi survives behind within the wire compound of the detention centre, overcrowded bodies neglected under the parched Australian sun. Subhi is one child of thousands of men, women and children escaping their homeland and applying for asylum in Australia. Born within the compound, his family surviving the harrowing journey from Burma where his father is under political incarceration. Persecuted and malnourished, families are placed within the compound and abandoned by the Australi Eight year old Subhi survives behind within the wire compound of the detention centre, overcrowded bodies neglected under the parched Australian sun. Subhi is one child of thousands of men, women and children escaping their homeland and applying for asylum in Australia. Born within the compound, his family surviving the harrowing journey from Burma where his father is under political incarceration. Persecuted and malnourished, families are placed within the compound and abandoned by the Australian government, segregated from their family members while abused and tormented by confinement. The Bone Sparrow revolves around the life of Subhi, a refugee born in an Australian permanent detention centre. Having never stepped foot outside of the fence, Subhi has no idea what life could be like. No matter if he has never known a life behind he fences, his world is bigger than the fences. When he meets Jimmie, a young girl from the Outside who needs someone to read her late mother's stories, he offers to help her. The Bone Sparrow is a captivating book. It brings light to a situation t The Bone Sparrow revolves around the life of Subhi, a refugee born in an Australian permanent detention centre. Having never stepped foot outside of the fence, Subhi has no idea what life could be like. No matter if he has never known a life behind he fences, his world is bigger than the fences. When he meets Jimmie, a young girl from the Outside who needs someone to read her late mother's stories, he offers to help her. The Bone Sparrow is a captivating book. It brings light to a situation that is horrifying but true. It is traumatic, saddening, and heartbreaking to read the way these people were treated. This is a story that delves into a situation that is still occurring to this very day. Just because one doesn't see it doesn't mean that it doesn't exist. The title does have a meaning in the novel [a sparrow carved from bone that symbolizes hope, protection, courage and faith, has been in Jimmie's family for a long time] which is a pleasant surprise. Jimmie, now the owner of the sparrow, believes that Subhi needs it more. Zana Fraillon brings to life these characters and portrays them honestly well tackling such a saddening topic extremely well. Overall, this is an captivating book that ensnares and engages readers from beginning to end. I definitely recommend that everyone, all ages, read this novel. ARC was kindly provided by Hachette Book Group Canada. Thank you. The Bone Sparrow was a captivating book about life in an Australia Immigration Detention Centre. A boy named Subhi is a refugee born in the Centre and all that his life consisted of was being behind fences. He has an imagination larger than himself. Life in the Centre is dull and boring and the one thing that keeps everyone from giving up is the memories and stories from the past. Subhi doesn’t have any other memories than the Centre so he needs other peoples, to realise what life was and what i The Bone Sparrow was a captivating book about life in an Australia Immigration Detention Centre. A boy named Subhi is a refugee born in the Centre and all that his life consisted of was being behind fences. He has an imagination larger than himself. Life in the Centre is dull and boring and the one thing that keeps everyone from giving up is the memories and stories from the past. Subhi doesn’t have any other memories than the Centre so he needs other peoples, to realise what life was and what it could be. When he meets Jimmie a young girl from the Outside, desperately needing someone to read out her late mother’s stories, he offers. The bone sparrow actually is a sparrow carved from bone that has been in Jimmie’s family for a very long time. It symbolizes hope, protection and courage. Jimmie is now the owner of this ‘bird’, but once she sees the conditions of the Centre she believes that Subhi needs it more. I really enjoyed this book and loved how it was written. I praise Zana Frailon for writing about such a confronting topic. Although she is an adult she has portrayed a child’s perspective extremely well. The only fault I can find in this book is that the story is sad and slightly traumatic. However, this isn’t a fault in the writing, it is the horrible way that people were treated. It's really hard to rate a book like this when the subject matter is so devastating and infuriating. I had only just learned about the Rohingya people and their plight when I picked up this book. It is eye-opening, to say the least. This book is beautifully written with MG characters I absolutely adored. The voice is perfect and hinted at some extremely dark content without becoming too graphic or explicit - kudos to the author for packing a punch in such a delicate way. There are however a few vi It's really hard to rate a book like this when the subject matter is so devastating and infuriating. I had only just learned about the Rohingya people and their plight when I picked up this book. It is eye-opening, to say the least. There are however a few violent scenes in this novel - and the main subject matter too - that I think might be too much for MG readers, so this book is probably more suitable for YA readers and adults. Subhi is a refugee. He was born from the only world that he know-the Australian detention center. His mother and sister tried to get away from all the disturbance and fighting(which ARE synonyms,) that was happening in Burma, a distant homeland. Subhi has never gone out before. But each and every night, he can hear the ocean nearby and everything in it, and the Sea brings him all kinds of gifts-his treasures. One day, Subhi sees a rather shabby-looking girl-'scruffy', Subhi describes her. Her nam Subhi is a refugee. He was born from the only world that he know-the Australian detention center. His mother and sister tried to get away from all the disturbance and fighting(which ARE synonyms,) that was happening in Burma, a distant homeland. Subhi has never gone out before. But each and every night, he can hear the ocean nearby and everything in it, and the Sea brings him all kinds of gifts-his treasures. One day, Subhi sees a rather shabby-looking girl-'scruffy', Subhi describes her. Her name is Jimmie. He sees her on the other side of the wires, who carries something that seems to be a notebook apparently written by her mother, who she lost. Jimmie can't read it herself, so she asks Subhi to read for her, which soon unravels her family's tragedic stories that are enclosed inside. I would highly recommend this book to those who enjoyed 'A long walk to Water' by Linda Sue Park, and maybe for those who enjoyed 'The boy in the striped pajamas' by John Boyne, because I think has a similar style to it. Very gripping and thrilling novel - I was almost always hooked. Admittedly, it was somewhat slow moving at the beginning, but once you embraced the themes and allegories which this novel so beautifully creates, it becomes not remarkably dissimilar to a thriller. To anyone who wants to learn about the world and the horrendous conditions in which some of our species are kept in, this is a MUST READ. It is a real eye opener to the conditions and I would challenge anyone who contradicts me to being i Very gripping and thrilling novel - I was almost always hooked. Admittedly, it was somewhat slow moving at the beginning, but once you embraced the themes and allegories which this novel so beautifully creates, it becomes not remarkably dissimilar to a thriller. To anyone who wants to learn about the world and the horrendous conditions in which some of our species are kept in, this is a MUST READ. It is a real eye opener to the conditions and I would challenge anyone who contradicts me to being ignorant and selfish. Wow! Dieses Buch war wirklich einzigartig! Der Schreibstil war unglaublich poetisch und flüssig. Die Geschichte war sehr berührend und traurig aber gleichzeitig wunderschön geschrieben! Ich bin wirklich begeistert von diesem Buch und kann nicht in Worte fassen was ich beim Lesen empfunden habe! Hot or not met de Hebban YA Club van 10 volgt komende week op Hebban.nl. Dit boek verschijnt op 6 juli. Ondanks dat het onderwerp van dit boek interessant was, vond ik de schrijfstijl totaal niet fijn, waardoor dit boek mij niet helemaal kon raken. Jammer! Many people have compared this book to ‘The Boy in the Striped Pyjamas’ and while I agree the subject of both books is touchy and eye-opening, I didn’t find this one to be as emotive as the boy in the striped pyjamas. Despite this, I did feel attached to Subhi and the writing made me feel sympathy towards him. This book does help you to realise how much of a privileged you have. I just felt it took quite long to get into and was a bit boring at first. Zana Fraillon was born in Melbourne, but spent her early childhood in San Francisco. Zana has written two picture books for young children, a series for middle readers, and a novel for older readers based on research and accounts of survivors of the Forgotten Generation. She spent a year in China teaching English and now lives in Melbourne with her three sons, husband and two dogs. When Zana isn't Zana Fraillon was born in Melbourne, but spent her early childhood in San Francisco.